Make your own tangram set using the instruction son the Making a Tangram Set page (click here for PDF), and Tangram Template (click here for PDF). Making the set is a good opportunity for you students to see how these pieces can fit together to make a square. If you would prefer to make it a little easier for your students, or if you are working with younger children, you can photocopy the Tangram Template, also found after these activity sheets. You can either have students cut the pieces out along the lines, or you can cut sets ahead of time for the whole class. Ask your students if they have ever played with a puzzle before (the kind with pieces that fit together). Is there more than 1 or only 1 way to solve this kind of puzzle? Tell your students that they are going to play with a kind of puzzle with pieces that fit together in lots of different ways. This puzzle game is called “tangrams” and comes from China. If you have a world map, have them find China on it. Make your own tangram set and see if you can solve the tangram puzzles—or make your own tangram shapes! Divide your class into teams of 2 for this activity, and make sure that the pairs are working together to solve the tangram puzzles. If you have photocopied the template, have your students cut their pieces out. If they are making their set from a blank sheet, hand out paper and either distribute copies of the Making a Tangram Set page, or demonstrate along with them as they fold and cut. Once the tangram sets are made you should have 7 pieces (5 triangles, 1 square and 1 parallelogram). Playing the game is fairly simple—see what shapes you can make with the tangram pieces. The only rules are that you must use all 7 pieces, the pieces must lay flat, each piece must touch at least 1 other piece and no pieces may overlap. For the first challenge, ask teams to mix up their 7 pieces, and then put them back together into a square. If any teams are able to make a square, challenge them to next form all 7 pieces into a rectangle. Once each team has played with this challenge for a few minutes, bring the whole group together to talk about what they discovered. Was it easy or hard to fit the pieces together into a square? If they created their own set of pieces, did it help that they saw the pieces together as a square earlier? Can they think of any other shapes they might be able to make? 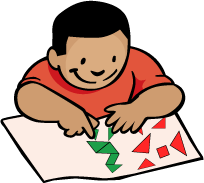 It is very possible that some of your students have played with tangrams before. Ask if any of them have, and what shapes they have created with tangrams. Make copies of the Tangrams Puzzles sheet (Click for PDF), or draw some shapes that you select from that sheet on a piece of chart paper or a chalkboard. Challenge the teams to come up with a solution—remember, they must use all 7 pieces of their tangram set to create the shapes in each puzzle! Solutions for the puzzles can be found here (Click for PDF). As your students are solving these puzzles, ask them questions about their process, like “How many different ways can you fill in one puzzle?,” “What do you do when you can’t figure out a puzzle?,” “How are shapes similar?,” “Can you substitute some shapes for others?,” etc. At the end of the session, have students share their solutions with each other. The word “tangram” is not Chinese—it is an English word invented by people who liked playing tangrams. Tangram pieces were traditionally made from clay, stone, bone or other easy to find materials. More recently, these puzzle pieces are often made fro plastic or wood. There are hundreds of more puzzles to do—find a book or research sites on the internet for more.